The sprinter progresses as the fastest loser. 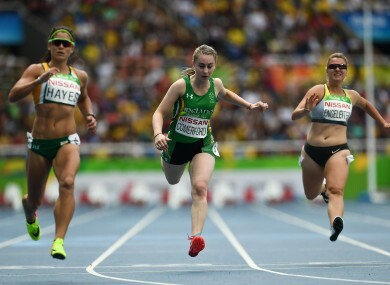 ORLA COMERFORD HAS qualified for tomorrow’s T13 100m final after producing a personal best run in her first taste of international competition. The 18-year-old, who has just completed her Leaving Cert, progresses as the fastest loser from this morning’s heats in a time of 12.81. With her family watching from the stands inside Rio’s Olympic Stadium, the Dubliner matched her rivals stride-for-stride down the first 50m and although falling away as the line approached, a fourth place finish was enough to advance. She will be back on the track for Sunday’s final at 3pm Irish time. Email “A star in the making! 18-year-old Orla Comerford sprints into Rio final ”. Feedback on “A star in the making! 18-year-old Orla Comerford sprints into Rio final ”.